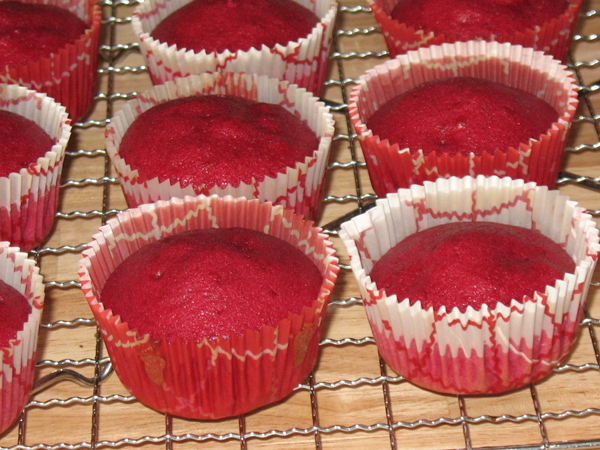 O Canada cupcakes – by Patty! 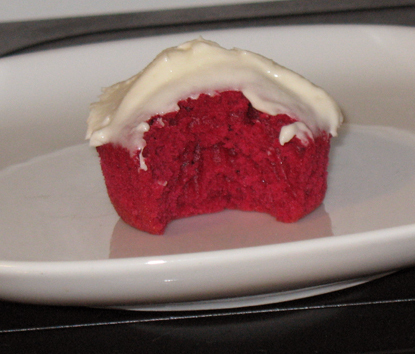 These cupcakes have a lot in common with red velvet, but they are not red velvet, they are full of real maple goodness instead. I wanted to make something with our official colours, and a flavour that is undeniably Canadian. 1. Pre-heat oven 177°C / 350°F. 2. Combine all ingredients in mixing bowl. 3. Beat on High for 4 minutes, scraping sides constantly. Once everything is in, add the food colouring. Totally didn’t bother measuring the red dye. Perhaps not the best plan. Yuck, pink isn’t one of Canada’s colours, this won’t do!! 4. Ladle into muffin pan, filling about two-thirds of the way. 5. 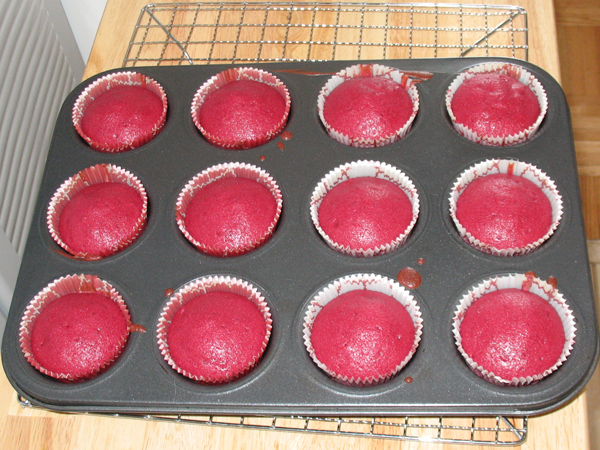 Bake 20 min, and immediately remove cupcakes from pan and place on cooling rack. 6. Cool at least 1 hr. 1. 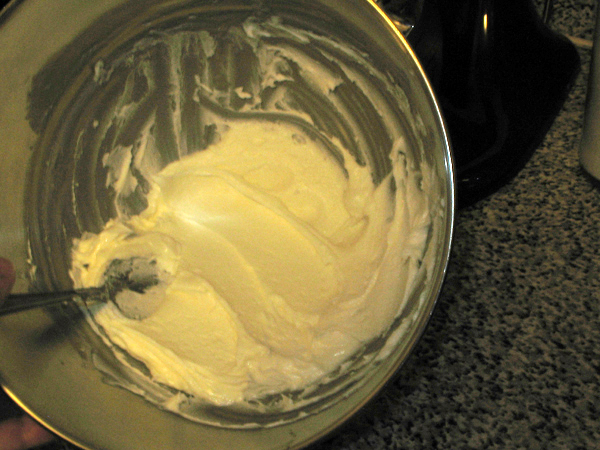 In large bowl, cream butter and icing sugar together. 2. Add half of the milk, and mix well. 4. 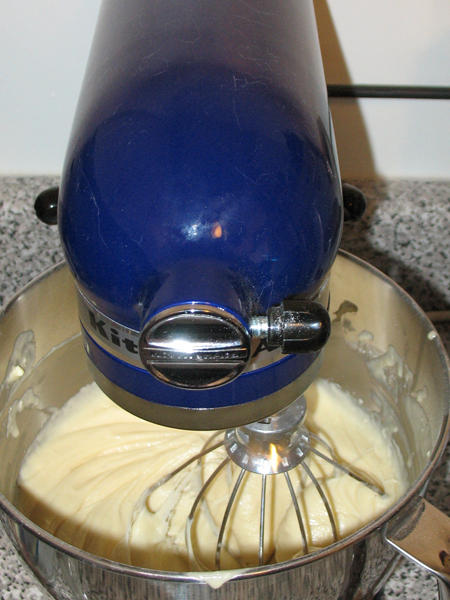 Add remainder of the milk and lemon juice. 5. 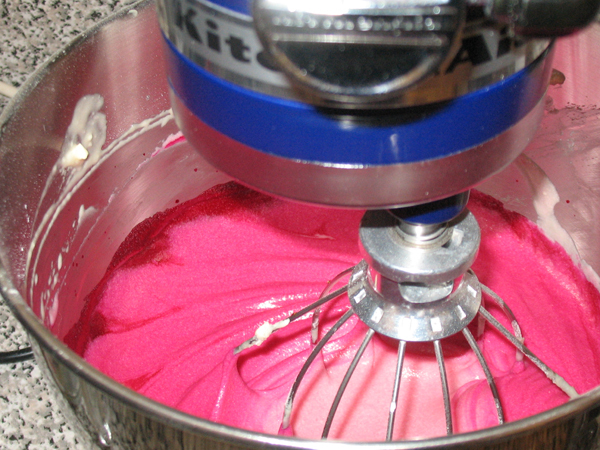 Mix until you can no longer feel sugar granules. 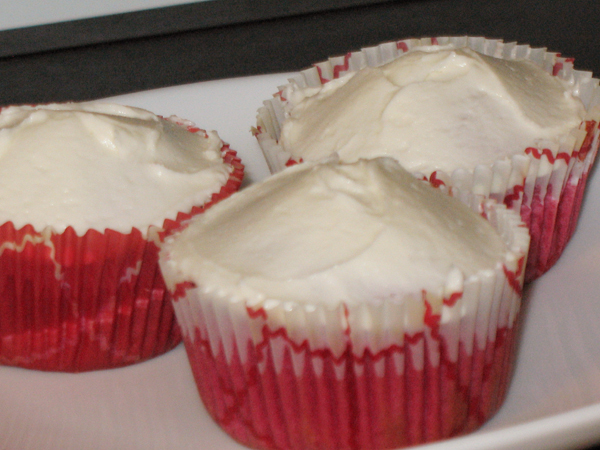 After they are frosted, get patriotic and devour!! Hurrah! They turned out red after all! Miracles do happen. Verdict: You know, this is the first time I have actually gotten exactly 24 cupcakes, usually I run out before I get to the final one. Yes!! 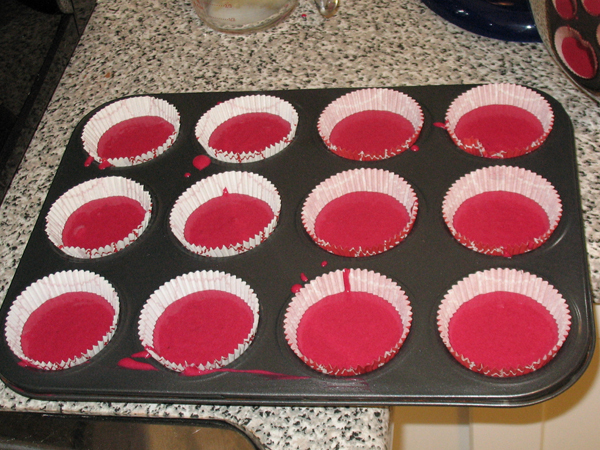 The colour did darken as they baked. Thank God. The maple flavour was very subtle, almost to the point I didn’t notice it. Next year I’ll increase the amount of maple syrup to at least one tablespoon. Boyfriend and I ate some cupcakes as we watched the Canada Day fireworks from our balcony. He said, “Patty, you make great cupcakes. 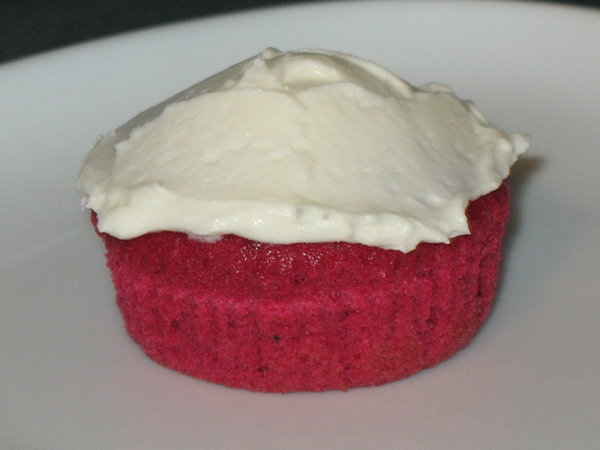 It’s like vanilla cupcakes, with lemon vanilla frosting.” (unintelligible salivating sound). 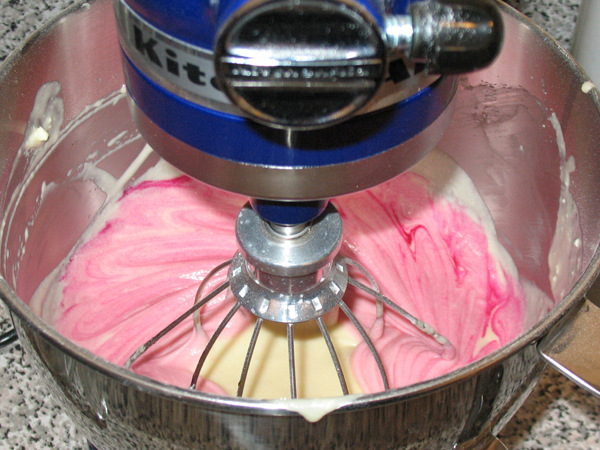 This entry was posted in cakes & cupcakes and tagged boyfriend, buttercream, Canada Day, cupcakes, experiment, food, KitchenAid, recipes. That in an excellent idea! I’ll pour it from my glass measuring cup next time. You mean the tips? I have them in several sizes, and instead of using a zip lock bag, when I’m done with a bag of milk I wash and dry it thoroughly, and cut off one corner. Voila! Instant, free, disposable piping bag.